For a complete longitudinal view of patient records, streamline a path to digitization through enterprise content management. Content management has come a long way from the days of siloed systems whose primary purpose was to convert paper records into digital formats—albeit often unsearchable and unalterable—for cheaper, easier storage and faster retrieval. Today, the focus is on enterprise content management (ECM) systems capable of automating information capture, converting it to structured data for import into EHRs and other systems, and presenting it back to end users in more meaningful ways to impact clinical and administrative processes. Whereas the primary benefits were once 24/7 access to patient information and the elimination of storage and paper costs, today's ECM systems offer advanced features such as optical character recognition scanning and electronic forms that streamline and automate processes with business process management tools. In addition, they consolidate disparate systems and reduce the overall IT portfolio, says Jessica Ahlert, RHIA, a hospital solutions product specialist for ChartMaxx solutions, ECM and business process management technology from Quest Diagnostics. "By using these tools, and via consolidation, ECM systems continue to deliver solid value year after year in terms of cost savings and increased efficiencies," she says. "In addition, ECM was an HIM tool in the past. Today, it's truly an enterprise tool that every hospital department leverages, thereby reducing the cost of ownership." Unsurprisingly, the driving force behind the evolution of ECM from paper-eliminator to data-integrator is the rapid adoption of EHRs. With more hospitals achieving paperless environments, the ability to capture patient information electronically at every point of entry and make it accessible in real time from multiple systems and in multiple formats has become a priority. "Health care organizations spend a massive amount of time, energy, and dollars on implementing EHRs. However, I'd estimate that a traditional EHR system captures only about 80% to 85% of content required for a complete longitudinal view of the patient record," says Michael Kortan, vice president of workflow automation solutions for Xerox's US large enterprise operations. "The other 15% to 20% is unstructured content that lives in a variety of forms, mostly paper." Some documents inevitably will be introduced into a hospital system on paper, such as the medical records of patients who are transferring to new providers and referrals from providers with disparate or no EHR systems. It happens more often than many may think, especially considering that as of mid-2015, 3.5% of US hospitals still had not implemented any form of EHR, according to the HIMSS EMR Adoption Model. The right ECM system can resolve the "paper or electronic" dilemma by providing a streamlined path to digitization. "An ECM system complements—in fact, completes—a hospital's EHR by digitizing this unstructured content and integrating it into the EHR, so a physician has one view of all relevant patient information," Kortan says. Another obstacle on the path toward a paperless environment resolved by ECM is one that plagues many aspects of HIT: interoperability. According to Jean Van Vuuren, a health care and life sciences enterprise account executive with Alfresco, which delivers ECM solutions across an open standards platform, it wasn't uncommon for hospitals to have multiple document management systems operating in silos. "It was unsustainable going forward," he says. "They would have a lot of legacy environments where unstructured forms were stored and clinicians would never get a full-patient view. Today, ECM provides the ability to consolidate into one scaled repository that gives context to patient data." A single, open source repository also can resolve the long-term data migration issues that go hand-in-hand with both interoperability and system expansion, upgrade, or replacement. While the data themselves will not change over time, the front-end applications that access the information will. An open source repository ensures data are accessible regardless of future systems, Van Vuuren says. Ahlert concurs that seamless system integration is an important pain point alleviated by the proper ECM system, as are "streamlining and automating processes to shorten timeframes and reduce staff burden, and providing new ways to gather information, including e-forms and mobile access. "An ECM system with robust monitoring and reporting tools enables management to access configurable dashboards that provide real-time status of operational flows, cost, and revenue data, and enables on-the-fly adjustments to staffing assignments," she adds. • automate the cash posting process to more quickly realize revenue. "These are just a few examples of areas where an ECM can have great impact in the revenue cycle area," Ahlert says. "ECM with business process management throughout the hospital enterprise has the opportunity to reduce costs by eliminating manual processing, resulting in quicker turnaround times, increased efficiencies, and greater insight into the health of a process." ECM also can drive rapid reductions in costs associated with the capture, storage, and retrieval of paper records. For example, the New York University Langone Medical Center implemented a tablet-based registration process for patients at its Joan H. Tisch Center for Women's Health, a solution created through collaboration with Hyland Software, the creator of OnBase; Samsung Electronics America; and Computer SI. The immediate impact was the elimination of up to 200 sheets of paper per day that had previously been completed by patients at registration and manually scanned and indexed into the patient's EMR. Among the less obvious benefits of ECM are increased patient satisfaction stemming from enhanced efficiency and reduced wait times. Cost reductions also are realized in the form of reduced duplicate testing, increased patient safety, and improved clinician satisfaction. Properly designed ECM projects and workflows also will increase efficiency and accuracy, which are imperative when information is being accessed in near real time, says Amanda Blase, a senior health care consultant at Hyland. 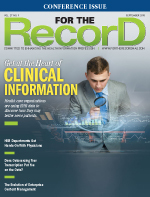 "Having clinical data available in near real time also reduces redundant testing," she says. "ECM allows for connections between systems so data are being brought in immediately. Clinicians are also more satisfied because they can access just one system instead of scouting out multiple systems by specialty. When they are happy, they will use [the technology]." Conversely, an improperly designed ECM strategy and/or inefficient system can have serious negative consequences ranging from increased costs and low or no return on investment (ROI) to low clinician adoption and increased clinical risk. For example, early ECM systems simply scanned medical records as static PDFs, forcing physicians to manually search through multiple pages for the specific information they needed for each patient encounter. When ECM can't make information available in a timely manner, it causes more than just clinical workflow disruptions. It also can impact care quality and safety. "High on the list of consequences is any delay in clinically relevant information being available for decision-making," Blase says. "Clinicians would be forced to make decisions based on incomplete information, which is more risk for both the patient and the organization." Van Vuuren adds that when ECM systems are deployed incorrectly or are ill-suited to the organization's clinical environment, "You can have data loss or present the wrong patient information. It's key that when these systems are deployed, they provide an environment that is easy to use for the clinical community. … These projects often fail because physicians looked at them and said they were of no use." Finally, a primary value of ECM is its ability to improve interoperability and information exchange, Kortan notes. Much like the gaps ECM fills by digitizing data and integrating it directly into the EHR, these systems also ensure that requests for patient information are managed compliantly and accurately across the enterprise. "EHR systems have functionality to release information, but without an integrated ECM system, the query will miss the 15% to 20% of unstructured content that doesn't live in the EMR," Kortan says. He adds, "Without an integrated ECM system, a hospital has to make paper copies in order to complete the information release request. … An effective ECM consolidates this effort, provides structure, and improves the security of patient information. It's simply not secure to have any patient records in paper form." With so much at stake, hospitals must remain alert to signs that their ECM may be in need of a refresh. One red flag is if scan volumes aren't decreasing as they should, given the expected decrease in paper entering the workflow. "Some of the most 'paperless' hospitals do the least amount of scanning. They are successful because their strategies have been to eliminate paper from entering the workflows on the front end vs managing the scanning at the end of the process," says Kortan, who advises hospitals to conduct a comprehensive ECM assessment to "identify areas of opportunity, explore industrywide best practices, and understand how hospital peers are achieving successes." Blase recommends annual evaluations to identify any issues that may indicate low user adoption or satisfaction. Determine if all available document types are being utilized and reconfigure or eliminate settings if they are not. Identify clinicians' wants and needs such as a mobile option that allows access when they are away from the hospital. It also is helpful to meet with ECM vendors on a regular basis to determine whether there are new features or functionality that may maximize ROI. Its ability to ensure long-term data access regardless of front-end systems has made vendor neutral archive (VNA) an area of growing interest. VNA works by enabling organizations to natively and securely capture, store, and access both digital imaging and communications in medicine (DICOM) and non-DICOM content into a single repository for all clinical, administrative, and financial content. "Use the product in a forward-thinking fashion," Blase says. "Definitely look at where your vendor is headed in their mobile world [and] what their play is in the VNA world." Van Vuuren notes that evaluating the effectiveness of indexing and categorization helps ensure the right demographics link to the proper patients. He also advises looking for a platform that is open and scalable for easy access and integration, and to seek out an ECM partner that understands health care. "If you don't," he cautions, "you'll have a technology team that doesn't understand that you need a platform suitable for clinicians, that understands where they get their information. It's not just traditional medical records but also radiology, video, etc. That's where the real value is." The team tasked with evaluating the efficiency of the ECM system is critical to success. The most effective approach is to include input from HIM, IT, and clinical staff, each of which brings a unique perspective to the table. As the keeper of the medical record, HIM is most familiar with what's important, including the compliance issues pertaining to HIPAA and other privacy concerns. IT needs to have the resources to support and upgrade as needed, while clinicians are the ones who can say with certainty whether the ECM fits within the workflow. The key to long-term ECM success is proper structure, which allows for easy access to and seamless integration with existing applications, both of which contribute to high adoption and satisfaction rates. Rules governing the storage structure also are imperative to realizing ECM's real benefits. Finally, clinicians must find it easy to use, trustworthy, and nondisruptive. "It's important to remember that health care organizations are no better off simply because information is now digitized. Imagine if you stored all of your work and personal documents on your desktop. Without a structured folder system, it might be even more difficult to find what you are looking for than if the information was paper-based," says Kortan, adding that the system "must be integrated seamlessly with existing applications to ensure staff adoption. It's not realistic to expect physicians to learn yet another system, so the ECM must look and feel exactly like their EMR. This way the physicians simply require remedial training on additional features and functionality, rather than [having to learn how to navigate] an entirely new system."